Modern America seen in pictures. Graphs, not photos. Facts, not impressions. I strongly recommend taking the time to look at the graphics in today’s links. The story they tell is unpleasant, but important. If you find this useful, please pass it to a friend or colleague. The first two articles above are fascinating, and deserve to be read in full. The third is a study that shows the origin of the plutocrats increasingly dominating America’s elections. These two graphs tell the story. 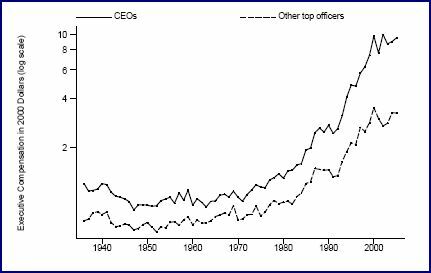 Figure 1: Median Compensation of CEOs and Other Top Officers from 1936 to 2005, in 2000 dollars. 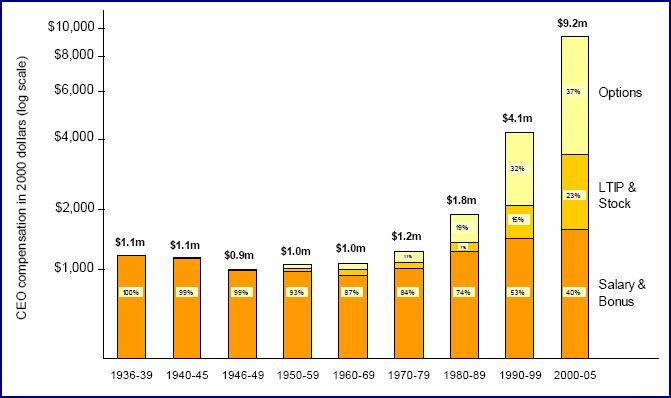 The median level of compensation of the three highest‐paid officers in the largest 50 firms in 1940, 1960 and 1990. Total compensation is composed of salary, bonuses, long‐term bonus payments (including grants of restricted stock), and stock option grants (valued using Black‐Scholes). It does not include “stealth compensation”: perks, severance payments, and pensions. Pensions total 1/3 of total compensation (except for those rare CEOs without pensions).